I know I’ve been posting an inordinate number of desserts lately, but they’ve all been for good reasons! Tonight’s reason was the most important one of all, my daddy’s birthday! YAY! Happy Birthday Dad! I let him select his birthday dessert from my pinterest page. At first, he was a bit overwhelmed. Because let’s face it, I’ve got a ton of dessert recipes lined up, just waiting for a reason to make them! Finally, after much deliberation, he chose the Better than Anything Cake. One note for you: The recipe says to let the whipped topping thaw to room temperature. I didn’t really notice that until the last second, and I just figured that being thawed in the fridge would be fine. Well, as you can see in the picture, the cool whip actually melted a bit once spread onto the cake, and it even slid off a couple pieces when we were serving them. So, make sure you follow the instructions and let your cool whip be room temp before spreading. And, I let the cake cool for 5 minutes as instructed, but you might want to wait even a little longer. Hopefully that will keep it from melting so much! Bake cake according to package directions in a 9x13 pan. Let cake cool for about 5 minutes. Poke holes in cake with the handle end of a wooden spoon. While cake is still warm, slowly pour over sweetened condensed milk over the top making sure some gets in all the holes of the cake. Next drizzle the caramel topping evenly over the cake slowly, making sure some gets in all the holes as well. Spread cool whip over the top evenly. Sprinkle with Heath Candy bar pieces. Store in fridge until ready to eat. Store any leftovers in fridge. It was so wonderful that she made the cake for you,also was wonderful that you praised her. Haha yeah, he’s pretty great And I ALWAYS bake with applesauce instead of oil It at least makes me feel less guilty about eating all those desserts! 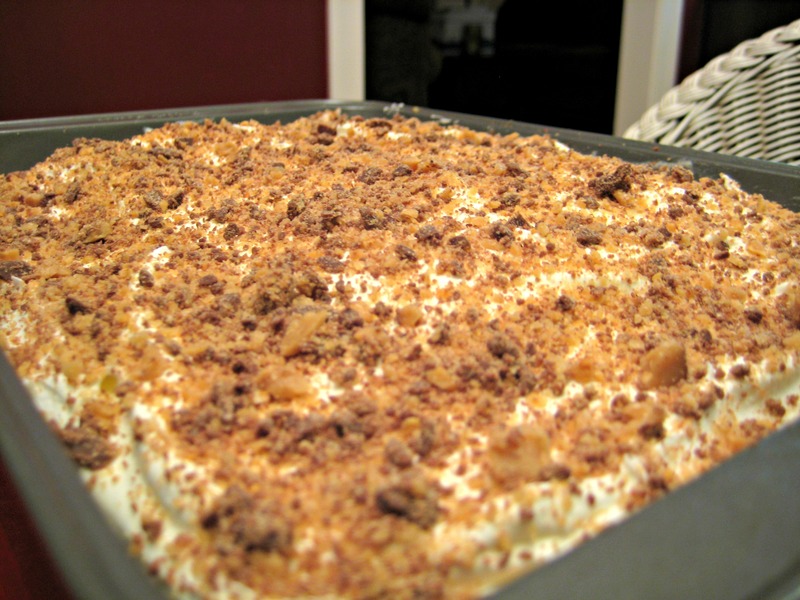 You can make this with Butterfinger candy bars too! Always a hit at church dinners! Butterfinger would definitely be good! And Twix! And Snickers! Ok now I’m craving candy. Lindsay: I made this to take to a potluck, and everyone loved it! Needless to say, I took home an empty dish. The only thing I did different: I softened, then whipped up 8 oz. of cream cheese to mix with the Cool Whip. I was worried about everything turning goopy before I got it to it’s destination. It spread really easy, styed in place, and tasted really good! This my husband’s next cake … Next week! He loves caramel and chocolate… Need I say more? I, too, will remember to use a package of cream cheese to tame the cool whip! Would the cake require refrigeration because of the cream cheese being added? I do think it would probably need to be refrigerated Just cover it tightly to keep it from drying out too much. This is also called poke cake and you dont have to put the whipped topping on right away You can let it cool, poke the holes, pour on the sweet milk then the caramel and then cover it with the whipped topping and refrigerate It is a favourite dessert in our home and best of all you can use other flavours like smuckers strawberry or raspberry syrup as well as chocolate. I know I should’ve let the cake cool more before I put on the whipped topping, but it was time for dessert, and who am I to keep the crowd waiting? It was at least mostly cooled though. I would really love to this in a bundt pan,do you think it would be OK?I know I would have to cook it a little bit longer.Please let me know,thanks…. Ummm I guess it could work! The only thing is…a bundt cake is MUCH deeper than one baked in a 9×13 I think all the condensed milk and caramel might just kind of sink to the bottom half of the cake Also, you would need real frosting instead of cool whip because I think it might slide off given the angles of a bundt cake. I don’t know though, the depth thing might not be an issue If you try it, please let us know how it goes! Hello Lindsay,I have to tell you that this cake in a bundt pan came out superb!I did not use the whole can of condensed milk,it just seemed like too much.I used a little carmel swirl and then when I cut it I put a little scoop of cherry pie filling,rediwhip and then topped it with the toffee bits.It was a true success.I also wanted to tell you that I love your site and thank you sooo much for answering me so quick. Awesome! So glad it worked out! Thanks for sharing with us so more people can try it out too! when using applesauce, is it an even swap? if it calls for half a cup of oil, do you sub half a cup of applesauce? Yes! It’s an even switch, and you can’t tell a bit of difference! thanks muchly, ms. lindsay i should have known gonna follow your lead i am a single father of two young boys and always looking for ways to improve my cooking. I have made this cake. It is AWESOME !!! Brought to a potluck and have to say, there was no cake left to bring home. They are wanting to know when the next one is coming. IT IS A GREAT CAKE. One of those finger-licking ones to same the least. Thanks for the post. Thanks Carolyn! Glad it was a hit at the potluck! 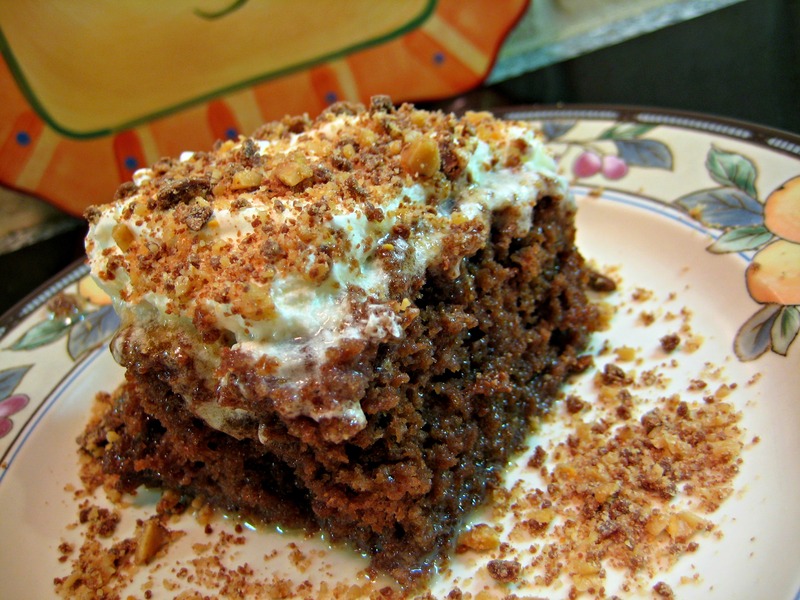 This one was so good, I need to try some variations of this poke cake recipe! I see you said that you used apple sauce instead of oil. In the UK we have apple sauce that we use with pork and we also have apple juice that we drink which would be the one you use in this recipe? The apple for the pork is very thick and would not I think be a good substitute for oil. What would you suggest please? Hi Dee, I’m not sure if our apple sauce is the exact same as yours, but it is actually somewhat thick. (Here’s a picture example of the consistency: http://www.budsmagazine.com/how-to/eat/apple-sauce/) It doesn’t seem like it would be an oil substitute but it is! I hope that this helps. I wish I knew for sure if your apple sauce were the same! Let me know how it turns out!